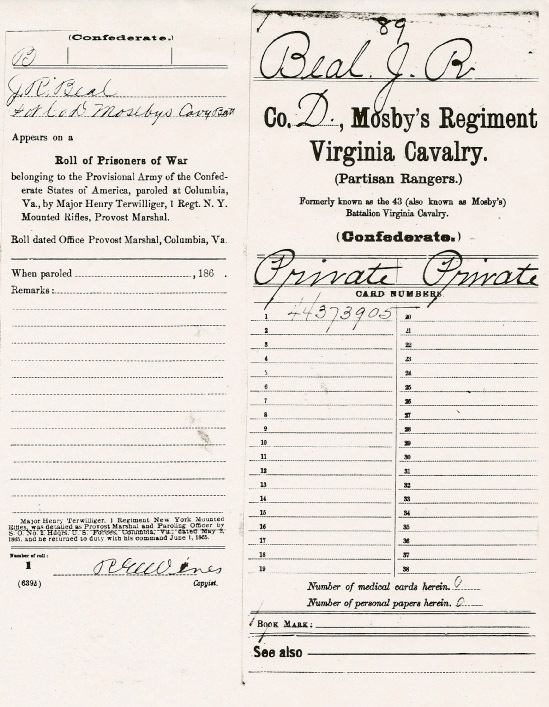 Comments: Private Joseph R. Beal served with Mosby's Rangers, 43rd Virginia Cavalry, Company D. Joseph was born in Scottsville, VA, on 5 May 1847, and was the son of Joseph Russell and Mary Elizabeth (Flanagan) Beale. 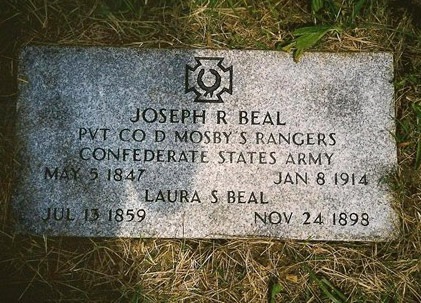 Joseph's older brother, John D. Beal, also served with Company D under the direct command of Captain R. P. Montjoy. The photo at left is of Joseph R. Beal ca. 1890 and appeared in James Williamson's book, Mosby's Rangers (New York: Ralph B. Kenyon, 1896). 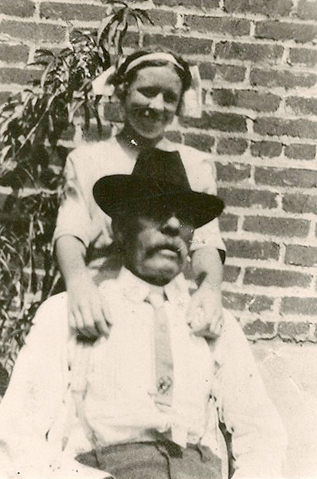 Above, Joseph Beal is shown with his daughter, Lena Beal, ca. 1910, in Roanoke County, Virginia. Joseph Beal married Laura Susana McDonald (b. 13 July 1859, Fincastle, Botecourt County, VA; d. 24 November 1898, Roanoke County, Va). Joseph and Laura Beal lived in Roanoke, VA, by 1882, and were the parents of five children: Mary Magdalena Beal (b. 5 November 1882, Roanoke, VA; d. 1931, Texas); Hester Beal (b. 27 September 1886, Roanoke, VA; d. 24 October 1958, Oklahoma City, OK); Nellie Bell Beal, b. 28 July 1888; d. 24 October 1958); Pechin Edmund Beal (b. 28 March 1890, Roanoke, VA); and Lena McDonald Beal (b. 31 August 1897, Roanoke, VA; d. 2 December 1974, Akron, OH). The top photo of Joseph R. and Lena Beal is part of the JoAnne Turner collection. Ms. Turner resides in Tallmadge, Ohio, and her husband is a direct descendant of Joseph Russell Beal. The upper left photo of Joseph R. Beal appears on page 436 of the book, Mosby's Rangers (New York: Ralph B. Kenyon, 1896), by James J. Williamson, who was a member of Mosby's Rangers, Co. A.